With patch v1.07 a wide variety of new and existing NPCs have been added to the main game, the Old Hunters areas and the Chalice Dungeons to aid you during the hunt, particularly during boss fights. The conditions for summoning these allies vary; the “Old Hunter Bell” is a universal requirement for calling any of them, but you must also equip the "Impurity" rune in order to summon League Confederates. 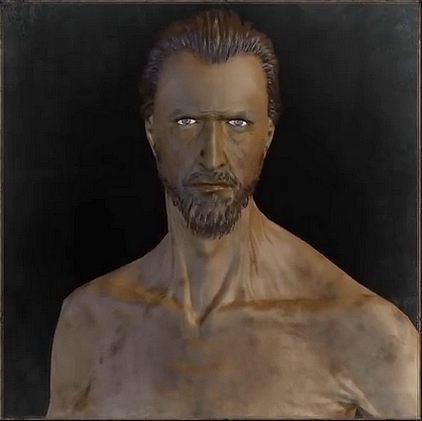 In certain cases you must begin or complete specific quests before summoning a particular character, such as Henryk and Valtr; in others you will lose your opportunity to summon the NPCs in question if you've already killed them, such as the younger Madaras twin. In some areas you may be able to summon up to two NPC Hunters. 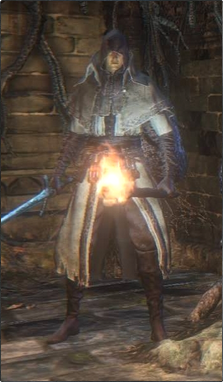 Cleric Beast in Central Yharnam: Summoned by the fountain past the burning effigy the townsfolk gather around. 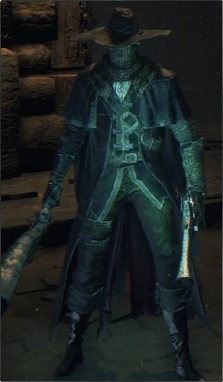 (Note: This is now the ONLY place he can be summoned from, as they removed the location by the Central Yharnam lamp behind the shortcut door. He will use Silencing Blank if you enter the sewer. 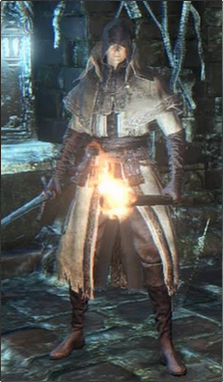 Cleric Beast in Central Yharnam: Summoned by the Gilbert's House down the stairs shortcut from Central Yharnam lamp. 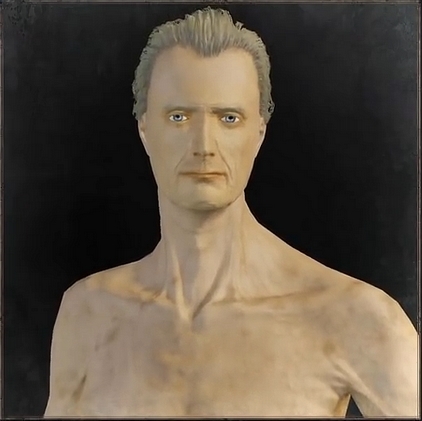 Blood-starved Beast in Old Yharnam: Found in the courtyard right before the boss battle. His summon sign will be on the bottom of the stairs as you enter the courtyard. You must have spoken to Alfred and agreed to cooperate with him. If you shift time into the Night, Alfred moves to his new position outside the Forbidden Woods, his summon signs disappear and won't be available for both boss fights. 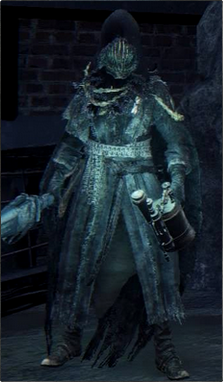 Vicar Amelia in Cathedral Ward: Go straight from the Cathedral Ward lamp, up the stairs, through the gate (must have unlocked gate first to take this route), and she will be straight ahead, near the ladder leading up to the body with 6 Numbing Mists. There are a lot of enemies in this area, so unless you clear them out first, the two of you will have a lot of fighting to do before you ever even get to Vicar Amelia. She cannot enter Oedon Chapel itself. 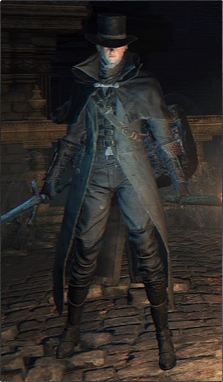 Shadow of Yharnam in Forbidden Woods: Along the wall at the intersection leading to the boss area. Rom, the Vacuous Spider in Byrgenwerth: On the second floor, between two couches near the treasure chest. He will not appear unless you have defeated him at the Tomb of Oedon and are wearing the " Impurity" rune. 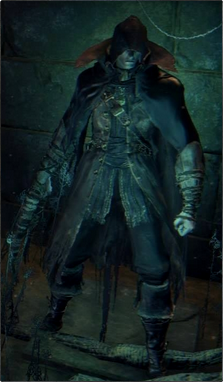 Shadow of Yharnam in Forbidden Woods: In the corner of the small gated area opposite the boss room, to the left of the corpse in front of the giant tombstone holding the "Clockwise Metamorphosis" rune. 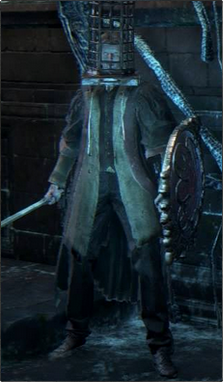 Rom, the Vacuous Spider in Byrgenwerth: Right next to the Byrgenwerth lamp. Walk off the little ledge, and it’ll be on that plateu with you, nestled between two trees. 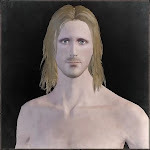 You cannot summon him if you have already killed him outside the Small Windmill or are not wearing the " Impurity" rune. 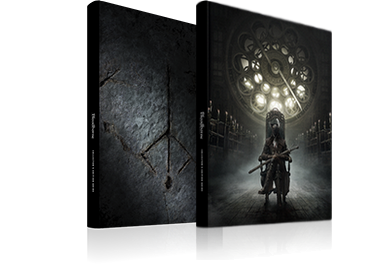 Rom, the Vacuous Spider in Byrgenwerth: In plain view outside the boss room. Ebrietas, Daughter of the Cosmos in Altar of Despair: In plain view in the hallway connecting the elevator to the Altar of Despair. Kill the Celestial Child first, or they may bite Damian and make him lose A LOT of health from frenzy damage. Bear in mind that summoning him will prevent you from being able to summon Henryk or the Younger Madaras Twin in Byrgenwerth, but his habit of spamming the Choir Bell makes him well worth the tradeoff. 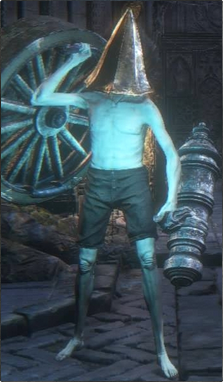 Darkbeast Paarl in Old Yharnam: When you drop down onto the narrow fenced path leading to Darkbeast Paarl, take a right to reach this summon point. The One Reborn in Yahar'gul, Unseen Village: Summon sign is behind the last carriage before the fog gate, on the left. He can't take the shortcut lift. 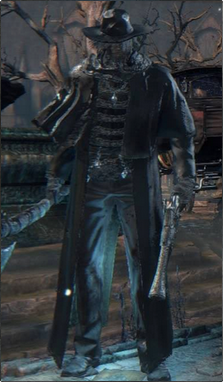 Darkbeast Paarl in Old Yharnam: In plain sight along the path to the Graveyard of the Darkbeast after dropping from the cave exit. The One Reborn in Yahar'gul, Unseen Village: Behind a carriage on the left side of the road a short distance before the boss room. In order to summon Yamamura for this fight, you must first kill him in the Hunter's Nightmare and equip the " Impurity" rune. You can summon either Yamamura or Antal to assist you in battle against Darkbeast Paarl and The One Reborn, but not both simultaneously. Living Failures in Research Hall: In plain view immediately to the right of the boss room entrance. Ludwig the Accursed in Hunter's Nightmare: Down the stairs from the Nightmare Church Lamp, directly to the left of the stairwell exit. 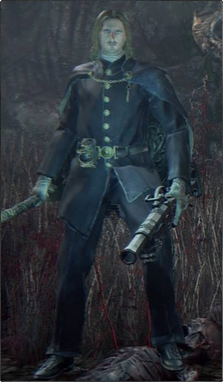 Summoning Henriett prevents you from being able to summon the two Confederate hunters in this area and vice versa. The summon point will only be there if you haven't already killed him in the Forbidden Woods, are wearing the "Impurity" rune, and have not summoned Old Hunter Henriett. 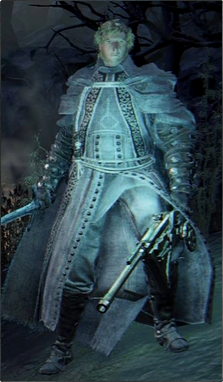 Ludwig the Accursed in Hunter's Nightmare: Along the right wall directly opposite the Eye Collector as you approach the boss room, slightly obscured behind the terrain. Laurence, the First Vicar in Hunter's Nightmare: In plain sight just inside the door of the Grand Cathedral. Isz Gravestone L3: To the right of the stairs leading down to the boss room. Summoning Damian will prevent you from being able to summon Wallar or Gremia, but his ability to use the Choir Bell with reckless abandon is a considerable asset. Isz Gravestone L3: The summon point for Tomb Prospector Gremia can be found behind a rundown old carriage, just to the right of the entrance to the boss room. Summoning Damian will prevent you from being able to summon Gremia. Pthumeru L3: In the left corner of the locked exit gate room that leads to the boss, just as you enter. Central Pthumeru L3: To the right of the exit gate to the boss room on this floor in a large, dark room. The summon point is in the far right-hand corner from where you enter. 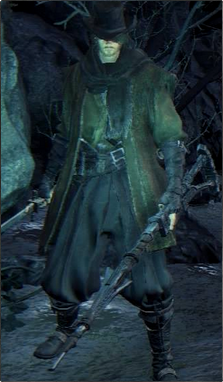 Lower Pthumeru L3: You can summon Prospector Olek just to the left of the entrance that leads to the boss room for assistance against Rom, the Vacuous Spider. Lower Pthumeru L4: Take the path to the left, just before the entrance door to the boss room on this floor and when you reach the room with the ladder, do not go up it just yet. In the top right corner from where you entered this room you see the summon point. Cursed Pthumerian Defilement L2: A little to the left of where you enter the large stone elevator room. Pthumeru Ihyll L3: The ladder well room with the locked exit door. Look to your left as you enter. Cursed Pthumerian Defilement L2: Summoning Olek will remove your ability to summon Queen Killer and vice versa. Pthumeru Ihyll L3: Summoning him will forbid you from summoning Queen Killer on this floor. Lower Pthumeru L3: The path to the right from the first Lamp on this floor will take you to the top level of the large garden area. On the right-hand corner of this platform nearest to the path that you took to get here is where you can summon him. Lower Pthumeru L4: Take the left door just before going straight ahead towards the boss room. In the next room with the Merciless Watcher guarding a chest containing a Sage's Wrist is the summon point. Pthumeru Ihyll L3: Once you've made your exit from the first tunnel, you can summon Madman Wallar from behind the large tombstone directly ahead. Cursed Pthumerian Defilement L3: The ladder pit room with the locked exit gate facing you as you enter. Just look to your left to spot the summon point. 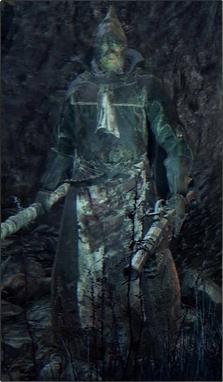 Isz Gravestone L3: This summoning point can be found in the room below the one containing the shop that sells the Sinister Isz Root Chalice. If you enter via the long corridor the boulder trap, it will be in the corner to the right. Make sure after summoning him that you exit the shortcut gate you can open in this room so he doesn't get crushed by the boulder! 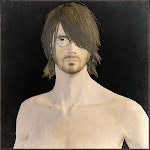 Pthumeru Ihyll L3: You won't be able to enlist the help of Prospector Olek and Queen Killer at the same time, but Madman Wallar can still be summoned regardless of who you choose, so be sure to summon him if you need the extra help. 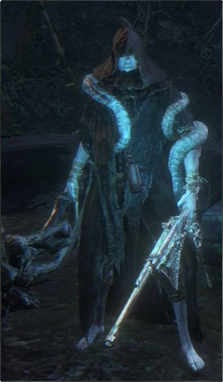 Cursed Pthumerian Defilement L3: Both Madman Wallar and Queen Killer can be summoned to take on Amygdala together. Ailing Loran L3: Shortly after passing the lamp on this floor you'll come to a crossroads room; take the path on the right and follow it round. The summon point is in the small room you enter in the top right corner. Lower Loran L3: At the bottom of the spiral staircase room you can summon Beastclaw Jozef. Ailing Loran L3: Summoning him will not allow you to summon Old Hunter Vitus on this floor. Lower Loran L3: Summoning him will not allow you to summon Old Hunter Vitus on this floor. Ailing Loran L3: Before entering the Abhorrent Beast boss room, look in the corner to the left and you'll find this summon sign. 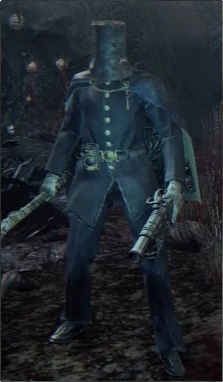 Uses a Beast Cutter and fights from a longer range than Josef, so he tends to last longer. Lower Loran L3: After entering the room with the locked gate leading to the boss chamber, head to the left to find the summon point. Ailing Loran L3: Summoning him will not allow you to summon Beastclaw Jozef. Lower Loran L3: Summoning him will not allow you to summon Beastclaw Jozef. Cursed Pthumerian Defilement L2: Just before you open the door to the boss room you can find the summon point for Old Hunter Queen Killer to your left. Cursed Pthumerian Defilement L3: This summon point can be found to the left of the stairs that lead down to the boss room. Both Queen Killer and Madman Wallar can be summoned to take on Amygdala together. 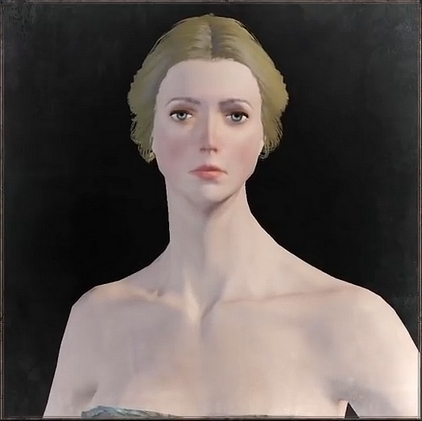 Pthumeru Ihyll L3: In the hallway, a little to your left, just before you head down the stairs to the boss room. 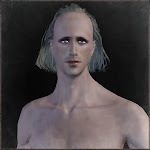 Cursed Pthumerian Defilement L2: If you have summoned Prospector Olek on this floor you will not be able to summon Queen Killer and vice versa. Pthumeru Ihyll L3: By summoning him you will not be able to enlist the aid of Prospector Olek on this floor. 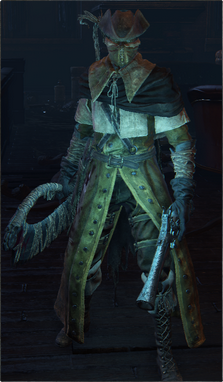 Old Hunter Queen Killer will drop a Blood Gem when he dies during the coop, check the research report page for more details.